I received a security update from TMO for LG G6 phone today (running Android 8.0.0). After the update, my phone will not remain connected to my car's phone/audio system. Connects... disconnects... connects, etc. ; will not stay connected for more than a second or two. I had this same issue with a much older phone (i.e. no longer supported), but all went away when I bought this one and everything worked perfectly. Today, new security update, no Bluetooth. Who should I be contacting about this? 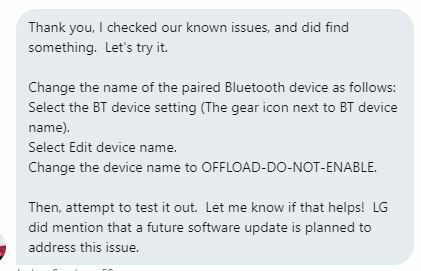 Just ran this by T-Mobile support and got this response back. I'm not able to test it out right now, so if someone else does, let me know if it works.